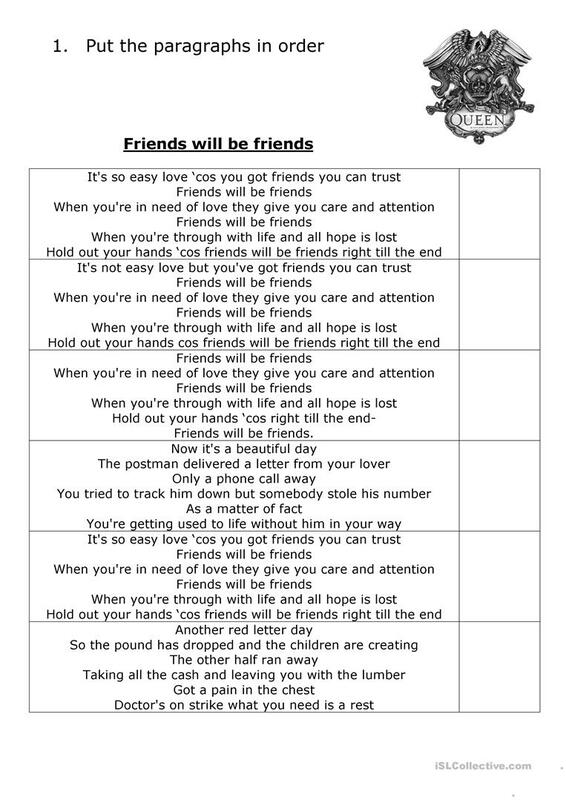 An exercise with the lyrics of the song "Friends will be friends" by Queen. The above downloadable handout is a great resource for adults, elementary school students and high school students at Elemental (A1) , Intermedio (B1), Pre-intermedio (A2) and Intermedio-alto (B2) level. It is aimed at consolidating Tiempos verbales in English, and is useful for honing your groups' comprensión auditiva skills. It is focused on the topic and words of Sentimientos. dreapink is from/lives in Spain and has been a member of iSLCollective since 2012-02-03 22:15:55. dreapink last logged in on 2013-01-26 10:11:30, and has shared 1 resources on iSLCollective so far.